transplant | he stole my kidney! The National Health Service (NHS) may not be perfect but I will do my utmost to fight for it should the need arise. Why? So that we NEVER have to go to the lengths some patients in allegedly developed top-notch countries have to go to. As a patient on haemoD (or indeed, any type of dialysis) Blokey was entitled to free prescriptions. He has a medical exemption certificate anyway, due to the issues with his thyroid (which may have caused his kidney failure, or may have been caused by his kidney failure; we will never know) but if he hadn’t his medication on haemoD would have been free. Once you’re not on dialysis anymore you have to start paying for your prescriptions. With the amount of meds a transplant patient has to take to stay alive this seems a tad ridiculous to me (when compared to some of the medical conditions which are exempt) but that’s by-the-by. If he did have to pay for his prescriptions he would buy a Prescription Pre-payment Certificate (PPC) at a little over £100 a year. Very much worth the investment. And other allegedly developed top-notch countries? I read horror stories of insurance only paying for medication for three years maximum, of patients having to prove they have a minimum amount of dollars in savings so that they can afford to pay the top up (if need be) each month, or indeed continue to pay for their meds when the insurance companies stop, just to get on the transplant List. It makes me angry that in order to live people are treated so appallingly. 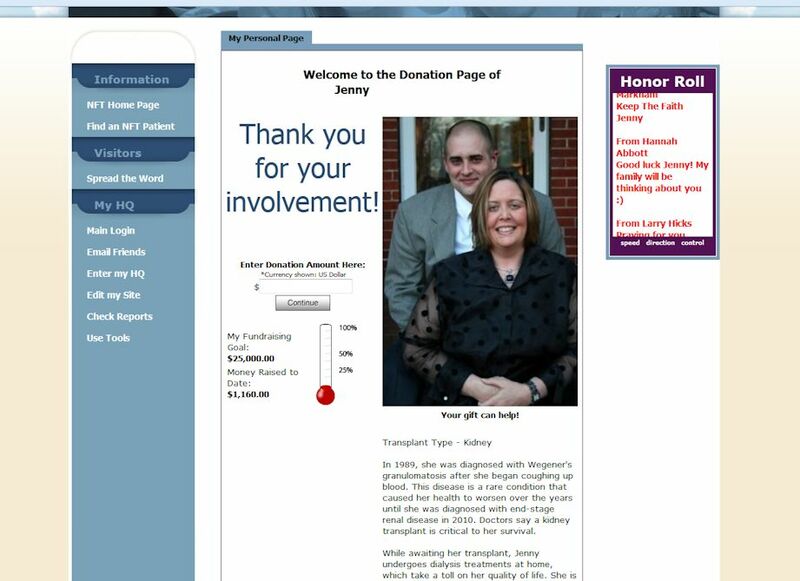 Jenny (see picture above, from this website) is in the USA and she needs a kidney transplant. She’s fundraising to help pay her expenses for having a transplant. In much the same way as some patients use the Internet to find a kidney, she’s using the Internet to find money from strangers. This is wrong on many levels; Jenny shouldn’t have to do this. When you’re living with CKD life is hard enough without having to worry about whether you can afford to go through with something which will not only greatly enhance your life (but not necessarily save it, lest we forget that) but will cost you less money medically than being on life-support (dialysis), which in turn makes you less of a drain on medical staff/Hospitals. And why should anybody have to ask/beg for money from other people for this reason? It doesn’t just make me angry … it makes me sad too. Blokey will always need medical care. If Our Kidney fails he’ll have to go back on dialysis. He will never be cured from kidney failure and there is no remission time where we will be able to celebrate so many years free from CKD. This is our life and our normal, and the NHS makes our life more comfortable and less stressful. If major changes are made to the NHS (imagine if we need insurance; Blokey’s premiums will be through the roof!) this won’t only affect us, it will affect everybody who becomes chronically ill, even those who advocate change. Do we really want to become less civilised, choosing for the rich to be worth more than the poor, creating a land where we don’t phone for the ambulance or visit our GP – regardless of how urgent or death-defying the situation is – because it is going to cost us; because it becomes a privilege rather than a human right? The NHS isn’t perfect. But it’s a more perfect system than other countries have and for that I will be eternally grateful. And I will fight to keep it near-perfect just so that we NEVER have to create a fundraising page for Blokey. Christmas was a bundle of joy this year. Or, it would have been had my MiL not grumbled copiously about dinner. Oh, I didn’t cook it … we went to the pub. Unfortunately we went to a different pub to the one we normally go to, at the request of my MiL. Ergo, it’s her own fault that she had to grumble and next year I’ll put my foot down and insist on going to the place we know and love. But it really was a bundle of joy. Blokey is still a little iffy with regards drinking and was worried about the sudden spike, and subsequent dip, of his creatinine levels. We didn’t have to think about fitting everything in around haemoD and he didn’t actually have to limit his fluid intake. Plus, he could eat what he wanted! Wowsers! I did miss the present from the dialysis unit though. Interestingly, Blokey is becoming more flippant with regards his fluid intake. Before the transplant he was completely AdamAnt that he’d have no issues with drinking and it would be a breeze! He was wrong (he often is) and it’s only in the last week or so that he’s been drinking (what I would term as) normal amounts. Yesterday we had his post-Christmas clinic and he’s been waiting for a phone call all day. It’s a phone call which hasn’t materialised and for that we are grateful; it means there’s been no sudden spikes or dips, and no helter-skelter results. Phew! He does still have a large (prominant) fluid collection but he was assertive yesterday and Mr. Neph, Phwoar is going to speak to the surgeon about what to do next. His next clinic isn’t until the eleventh. He’s back with the local anti-coagulation clinic for his warfarin, and on Tuesday he’ll be returning to work.